The Progressive Gloves are complete. I really enjoyed knitting these and I've already made plans to knit more. I finished them on the Monday before Thanksgiving, but due to the holidays I was lax in taking pictures. I finally finished the first Maze sock. 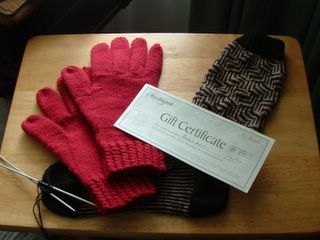 In the photo is my gift certificate for sending in the pattern corrections. After looking through the catalog and realizing that I own an obscene number of books printed by this company, I chose Dazzling Knits. I'll finally get around to using more of the Silk Garden and Kureyon I have in my stash. Those maze socks look amazing! Thank you for the littleknits reference a few posts back. I am so impressed with the maze socks. WOW. You have so much more patience than I. Happy New YEar. I've Got A Peaceful Palm!! !